Second Harvest Food Bank of North Central Ohio, Greater Cleveland Food Bank, The Akron-Canton Regional Foodbank, and the Second Harvest Food Bank of the Mahoning Valley will collaborate once again on the 28th annual Harvest for Hunger Campaign. A new component of this year’s Campaign is the Week of Giving. The Harvest for Hunger Week of Giving is a joint effort among all four food banks and provides an opportunity for community members to get involved in local hunger-relief efforts, while providing fun and tangible ways to be part of the Campaign. 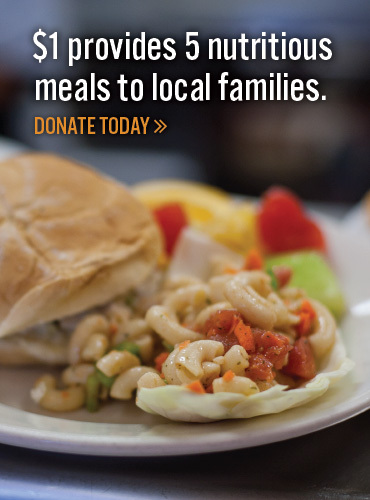 Monday, April 1, 2019 – Make a Donation Monday Help us reach our 2019 Goal to provide over 1.25 million meals! Make a donation at www.secondharvestfoodbank.org. For every dollar donated, Second Harvest can provide 5 meals to local familes, children, and seniors struggling with hunger. Tuesday, April 2, 2019 – Take a Tour Tuesday Visit your Second Harvest, located at 5510 Baumhart Rd. from 10:30 - 11:30am & 4-5pm. Take a tour of the warehouse and see your donations hard at work. Wednesday, April 3, 2019 – Volunteer Wednesday Volunteers are crucial to the work of Second Harvest. It’s because of volunteers, we are able to provide food and other essential items to our community members in need. To volunteer, please contact Susan Hennie. Thursday, April 4, 2019 – Thankful Thursday Print and snap a photo with a support sign found HERE. Post and tag us on social media, #HarvestForHunger, to show your support for the Harvest for Hunger Campaign. Saturday, April 6, 2019 – Supermarket Saturday Have your groceries bagged by local celebrities when you make a $10, $5 or $1 donation at the cash register! Tiffany Tarpley, WKYC Anchor and Reporter, and others will be bagging groceries from 11am - 1pm at the Amherst Giant Eagle location, along with Mayor Greg Zilka and friends will be helping bag from 11am - 1pm at the Avon Lake Giant Eagle location. Sunday, April 7, 2019 – Sunday Funday Enjoy National Beer Day & Hops for Hunger with at Railroad Brewing Company in Avon! Come and enjoy one of their unique fresh brews or enjoy food from Krav food truck and help raise funds for Harvest for Hunger. For every craft beer purchased from open to close on Sunday April 7th, Railroad Brewing Company will donate $1 to local families, children, & seniors at-risk for hunger! So come on out and help fight hunger one craft beer at a time!